Here’s the final results for the complete Caters Marine Spring Wednesday twilight series which I think (I hope!) is all correct. Congratulations to Kantime, Cut Lunch and Saltshaker who were the points winners of the A, B and C divisions respectively. I’ve also included the results of Race 3 of the Seapower 2-handed series sailed yesterday in a funny old breeze which trended more east than expected. However, it was ideal for California Kiwi which cleared away to a handicap win ahead of Caprice and then Casco only one second behind. 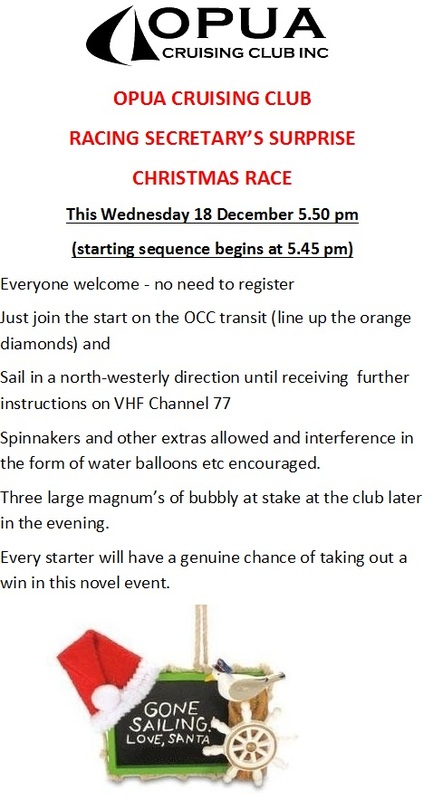 Finally, I’ve included notice of Wednesday’s “Racing Secretary’s Surprise” race design to give everyone who turns up a great chance to win one of three big magnums of bubbly. As the notice says just turn up for a start at 5.50 pm and head in a north-west direction and await further instructions via VHF.